It's a time in pop culture history that's seared into our memories. The world had already been watching Britney Spears unravel for years when she walked into a hair salon in Tarzana, California, a decade ago and shaved her head. Days later, a bald Spears attacked a photographer’s car with an umbrella while at a gas station before speeding away. It’s a moment in pop culture history that’s seared into the memories of anyone who even remotely followed celebrity culture in the aughts. But in the context of Spears’ overall breakdown, this event wasn’t even the “rock bottom” that would lead to a hospital stay and her current conservatorship. While we associate haircuts in pop culture with positive outcomes — a post-breakup fresh start, a makeover — the drastic act of shaving one’s own head takes on a different meaning. Spears literally removed one of her most clearly feminine signifiers, one that was seen as “desirable” on a pop starlet who had been sexualized from the get-go. Images of a wide-eyed Spears bald as the day she was born, gritting her teeth, are memorable not only because they are visually jarring when compared to her polished pop-star looks, but due to the nature of the act itself. For Spears, this was an act of defiance and liberation; throughout her life and career, she was rarely the one in control. Spears’ message was hard to forget, but the circumstances that led to that moment are just as important to remember. Spears burst onto the music scene in 1999 in pigtails and thigh-highs, openly promising to stay a virgin until marriage. She released three albums in as many years and became the reigning princess of pop, selling millions of records. But fame, success and wealth don’t insulate anyone from life’s problems. By 2002, Spears was dealing with a difficult breakup from Justin Timberlake and coping with her parents’ divorce. Not long after, the cracks started to show. By the time Spears was distressed enough to shave her head in 2007, she had annulled one quickie Vegas marriage, wed backup dancer Kevin Federline, gave birth to two sons, and filed for divorce. Spears had already spent the last few years derailing the carefully crafted image her managers cultivated for her throughout her marriage to Federline. “Federline gave Britney license to fully embrace her white-trash side — walking into gas-station restrooms barefoot, dumping ashtrays out hotel windows, wearing novelty tees like I’M A VIRGIN, BUT THIS IS AN OLD SHIRT and, most notably, not strapping the kids into car seats,” Vanessa Grigoriadis wrote in Rolling Stone in 2008. Britney Spears and Kevin Federline at the MGM Grand Garden in Las Vegas, Nevada. Spears’ behavior was increasingly erratic, and after becoming newly single, she was a fixture in the Los Angeles club scene. Wild nights with Paris Hilton, among other things, eventually landed Spears in rehab in Antigua. She left treatment a day later, headed back to LA, and went to see her kids. But Federline, who had teamed up with her mother and her manager, refused to let her near the boys until she agreed to register for rehab in Malibu. Furious at their demands, it was in this state that Spears drove to Esther’s Haircutting Studio and shaved her own head. The events that transpired in the months and years after this incident make it seem trivial in comparison. After losing custody of her children, the singer locked herself in a room with her son Jayden and refused to hand him over to her ex-husband. This led to the singer’s hospitalization in a psychiatric ward, where she was held involuntarily for observation. It was then Spears effectively lost her freedom. A judge awarded her father control of Spears’ personal and financial affairs ― a conservatorship that remains in place to this day, despite the singer’s attempts early on to fight it. The conservatorship, which reportedly remains in place indefinitely due to a medical issue and has never been publicly disclosed, is not something Spears has spoken about since talking to MTV in 2008 ― that is, until recently. While her comments were ultimately cut from the final broadcast, fans at a September 2016 taping of the “Jonathan Ross Show” reported that Spears finally addressed the conservatorship. “I felt like a lot of decisions were made for me, so I wanted [’Glory’] to be my baby and I’ve been really strategic about it,” she reportedly said, explaining that she’s slowly been able to gain more control over her own life. 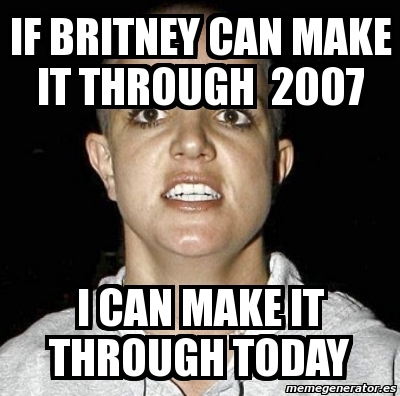 Spears, of course, is a success story. Today, the 35-year-old singer headlines in Las Vegas, making $30.5 million last year. She’s clearly flourished under her father’s watch, but there’s an unsettling irony that history will remember her most desperate attempt at autonomy.